Just eight of the 64 students were female and a placement as a Chain Lad reinforced the gender imbalance. But Diane’s ability impressed the firm, and she was offered a permanent role with Kilroe who funded her final year through university. Despite the scarcity of women in the company Diane was ‘shown courtesy and respect by the men’ and she fell in love with the camaraderie and team ethos of the industry. Diane’s success is built on nurturing a sharing-caring culture in the work place, defying a comment that she would never amount to anything if she didn’t stick up for herself. Eric Wright Group headhunted Diane and initiated her ascent through the ranks whilst simultaneously supporting her family by offering a company creche to the children of its employees and providing excellent maternity and paternity leave periods. According to Diane, fairness and equality are core elements in creating success and in stimulating productivity. 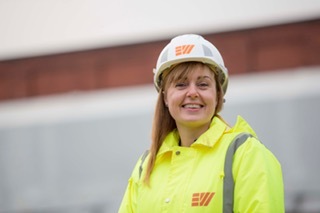 These values enabled her to become a Director of Eric Wright in 2012 and she was tasked with bringing the infrastructure and water teams together. As a result, she oversaw a 70% increase in turnover despite challenges in this market. Improving employee satisfaction has always driven Diane and she oversees the Health and Safety and Quality and Environment teams, using empathy to run a positive intervention based behavioural change programme. As Chair of the Eric Wright Learning Foundation, Diane is leading the way in inspiring young people to consider engineering. ‘The Head of Quality and Environment used to be a bricklayer; the Head of Construction used to be a joiner’ she said, demonstrating excellent career prospects for practical and hardworking individuals.